Gardman R162 Plant Caddy. 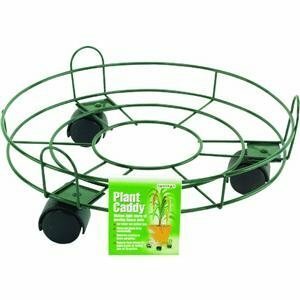 Use this 16”diameter, 3-wheeled plant caddy to easily move heavy potted plants around your home or garden. Sturdy metal construction with rust-resistant green enamel finish and easy rolling caster wheels. Designed to safely hold your planter for easy moving. Please take special care when placing your heavy planter into caddy. Dimensions: 16” Long x 16” Wide x 4.5”High. **Also available in two other sizes (sold separately): 10” model number R160, and 13” model number R161. Gardman "Bring your garden to life"